Ah - another bead artist to make me jealous!! The first thing I noticed when looking through SilverDragon's Etsy store is the gorgeous bead weaving that she does! I've made a few feeble attempts at beadweaving and did OK with some of the projects but got majorly stressed hands at the end of each! 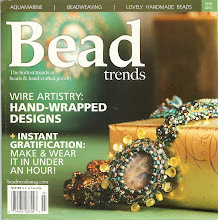 A lot of beadweaver's I know say they find it very relaxing to bead - I find it incredibly stressful! But, enough about me, let me show you some beautiful creations from Patricia. 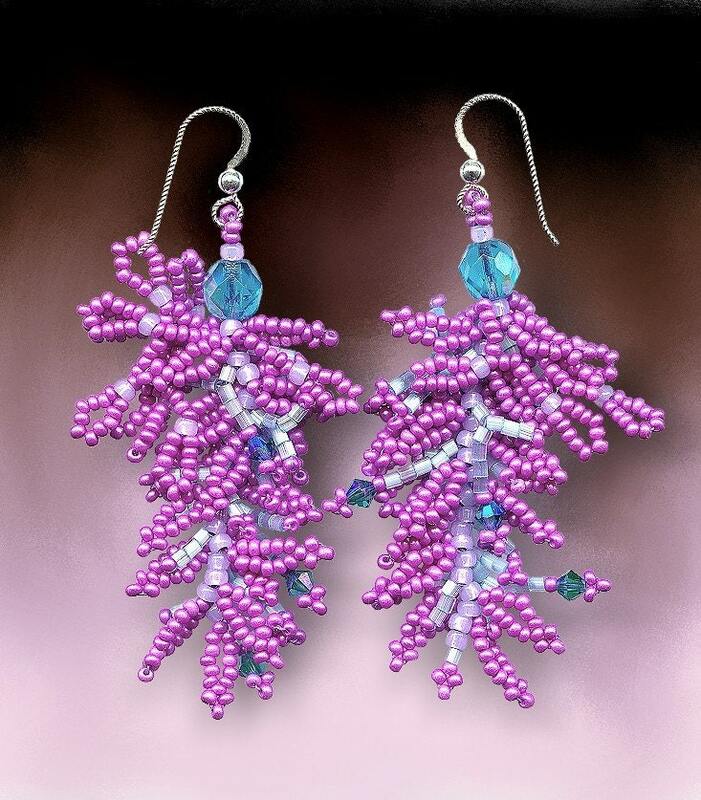 Here's is a wonderful, flashy pair of earrings created in my favorite color - PURPLE! I love the way the beads stick out all over kind of like your hair might if you stuck your finger in a socket (at least that's what they show in all cartoons - LOL! This wonderful necklace jumps out at you not only because of the color but also because of the movement you see in all those beaded dangles! 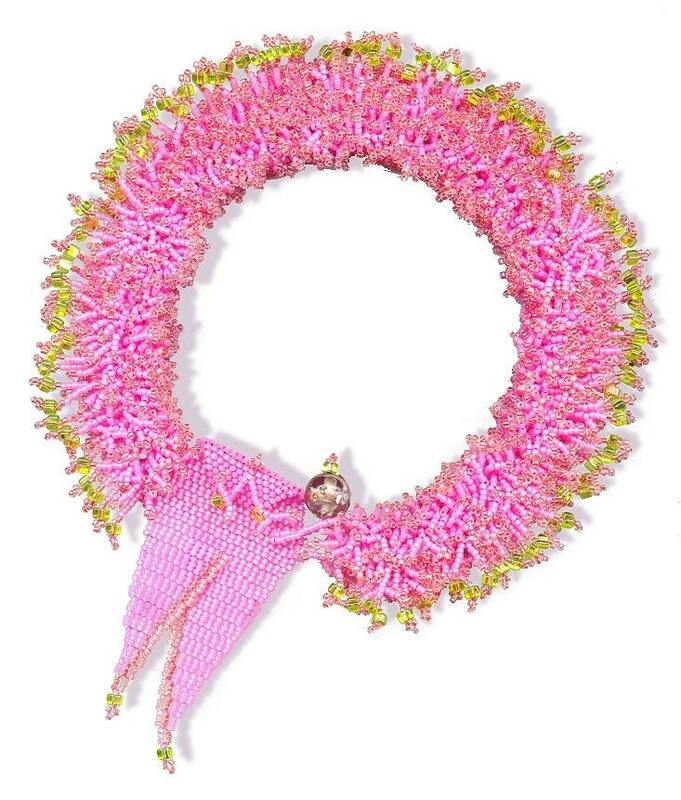 It's simply amazing what Patricia can do with seed beads! 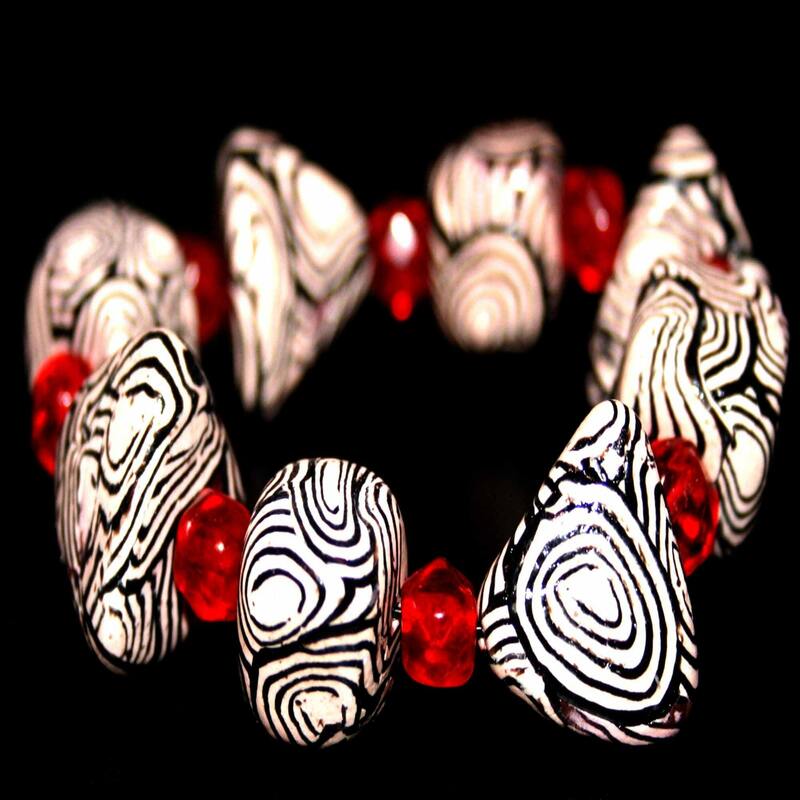 If bead woven designs aren't what you're looking for you can also find more traditional glass and lampwork bead designs in her store.Want to know more about her day-to-day happenings? If you do then be sure to check out her blog. I'm now rolling back to the beginning participants in the 90-day blog challenge (I think mine is going to be more like a 365 day blog challenge - LOL) and am starting with #1 - the woman who initiated this challenge - Pippit Carlington aka Giftbearer. Pippit creates art of many kinds - paintings, drawings, clay sculpture and of course jewelry! Jewelry is the primary focus of her Giftbearer Etsy store. She has another store, GiftbearerSupply where she sells various jewelry making and art supplies. Now ... back to her jewelry ... As I perused Pippit's shop I was drawn to several pieces. 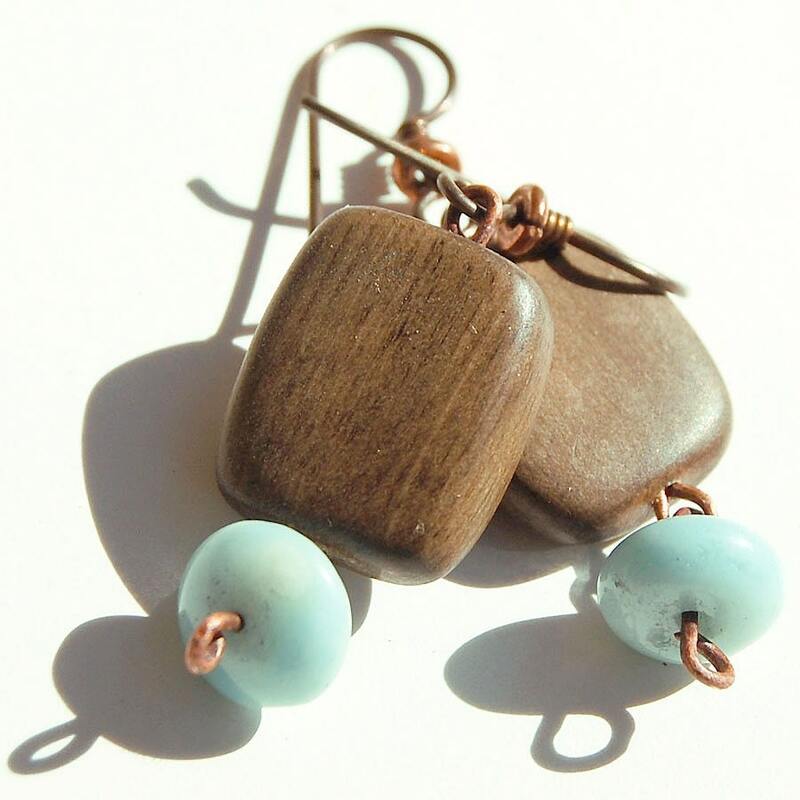 These Haiku earrings are absolutely wonderful! I happen to be a chocolate fan so you can always get my attention, initially, by making some mention of chocolate - LOL! Another passion of mine is purple and, since the violets in my garden are purple, I had to check out these Leafhearted-Fine Silver Violet Leaf Earrings. The process she uses to create them is quite cool (coating actually leaves in a fine silver slip and then firing). If you want to have some of these one-of-a-kind, unique from nature designs be sure to check out her Etsy store!. 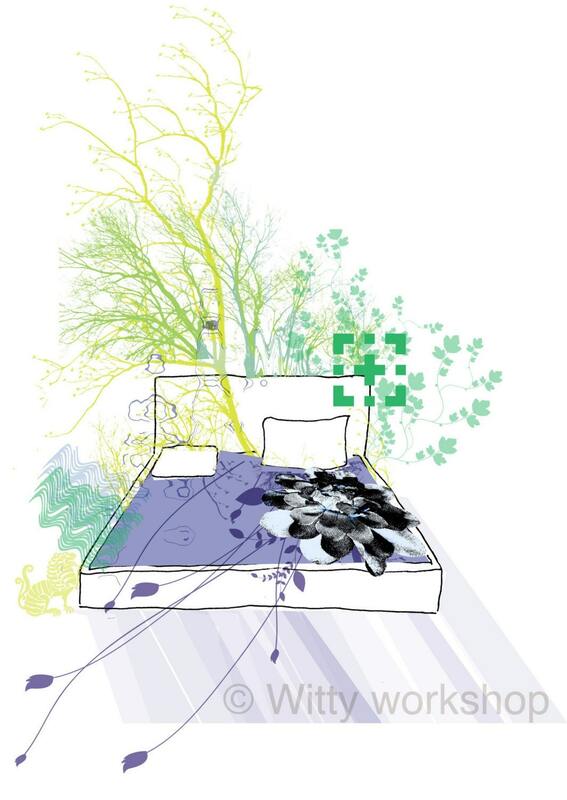 If you want to see the other art she creates and find out what else she is up to be sure to check out her blog. Today my featured artist is deabusamor aka Sheika Lugtu. Sheika lives in Victorville which is just up the road, about 3 hours, from my house. It's a small world in Etsy-land! In her own words Sheika is "a self-taught dabbler in various mediums". In her Etsy store you can find a variety of objects made from polymer clay - pendants, jewelry and cellphone charms. I thought this bracelet, Smooth Criminal is quite cool! Sheika also has some prints available. 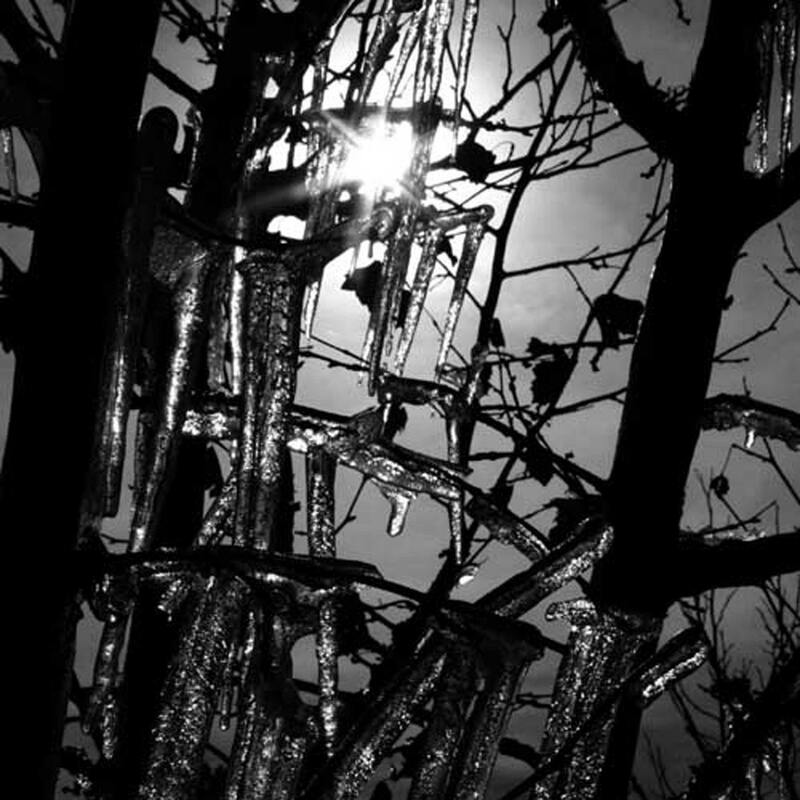 My favorite is Winter Solace a wonderful black and white print of dripping icicles. If you want to see more of her art dabbles you'll have to visit her Etsy store. Want to know more about her daily musings? Then check out her blog. She also has a website deviantArt! where she shares more of her thoughts and musings and instructions on how to make your own Xena duct tape dress form - it's an intersting read! So now you know what you have to look forward to in my future designs! Keep an eye on my website to see what I come up with! And here's an online friend I met in person at Tucson. Donna and I met in an Ebay group, TBO, and it was fun to finally put a real face to the online person! Here are Donna, my mom and me (Susan). We were in front of Colleen's lampwork booth! I'm in Tucson and having a blast. Had fun hitting the GLW and To Bead True Blue shows and reconnected with some lampworker friends. You can get great beadable items at the wholesale price if you have a resale license at Karen Thomas Designs table. You don't have to buy the minimums that are needed on the web either so I stocked up on pens and winestoppers. I bought more of the wonderful "twisties" from Colleen Girard of CLG Lampwork. She has a website, but her shopping cart is down so all you can do is drool over the samples she shows and email her if you have an idea on the color you want. She's going to make some chocolate colored twisties for my mom with some glass she's been "hoarding" since she can't get it anymore. We also hit the GLW show which has one of my favorite silver sellers (Kalpataru) who seems to always have the best price on silver (.59/g this year). But we also bought from another silver seller who had some fun beads/clasps at .65/g. Today we're off to Kartchner Caverns and will hit the show when we get back. Hopefully we can get back before 6PM when most of the shows close. One show is open until 8PM so at least we can go to that one if we get back late. One problem we've been having in Tucson if finding some good places to eat. If you like fast and/or greasy food there are many places - but if you want salads or lighter fare it is really hard to find some place. We hoped to give Chopped Salads a try but drove up just as they closed at 8PM - agh! We ended up at the Kettle Restaurant on the I-10E frontage road near St. Marys crossroad from what I recall. It wasn't bad - well my pork chop wasn't, but my mom's salad was. Tonight we'll give ChopStixx a try since it's near the hotel and sounded like the food might be a bit less greasy than what we've seen elsewhere. OK - gotta finish checking emails and then hit the road east for the caverns! Check back tomorrow for more happenings in Tucson! I'm heading to Tucson tomorrow for the gigantic Gem and Mineral Show!!! It is just a mindboggling show! The entire city becomes a venue for gemstones, minerals, jewelry, silver, gold, and just about anything else gem and mineral related! I did a rambo one day visit last year and was just amazed. This year I'm going for 3 days though I'll be spending part of Wednesday at the Kartchner Caverns. They look awesome in the few pictures I found online and I loved the Carlsbad caverns. Hmm - I better remember to bring a camera!! I can't wait to see what I find at the gem and mineral show! You'll know too once I start designing with my new finds. I always get lots of wonderful sterling silver beads there, but this time I'm also looking for some good gemstones for some designs I have in mind with components I bought in Pasadena. Keep an eye here or on my website for the new designs that show up! QuirkynBerkley (aka Carol) is a fellow Californian selling wonderful handcrafted paper goods. She has designed and sold handmade cards for several years around her neighborhood and now has her cards (and other paper items) for sale in her Etsy store. She has some great cards like these for Valentine's Day. 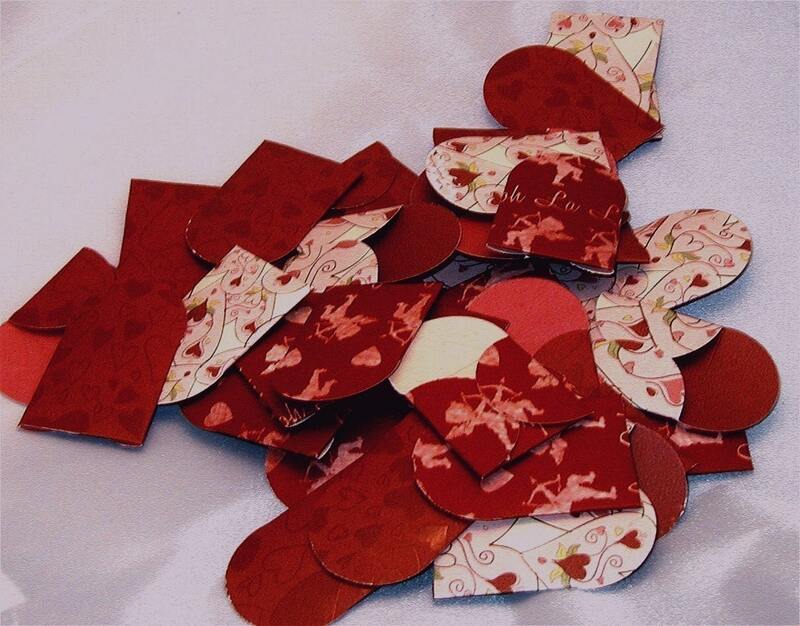 And even cuter are these wonderful teeny, tiny Valentine envelopes! You can use these to lead the love of your life on a wonderful treasure hunt through the house or through the neighborhood or through his or her office. Wouldn't that be a fun thing to do? And at the end of the hunt (and maybe during the hunt) you can leave lots of fun and love filled surprises! 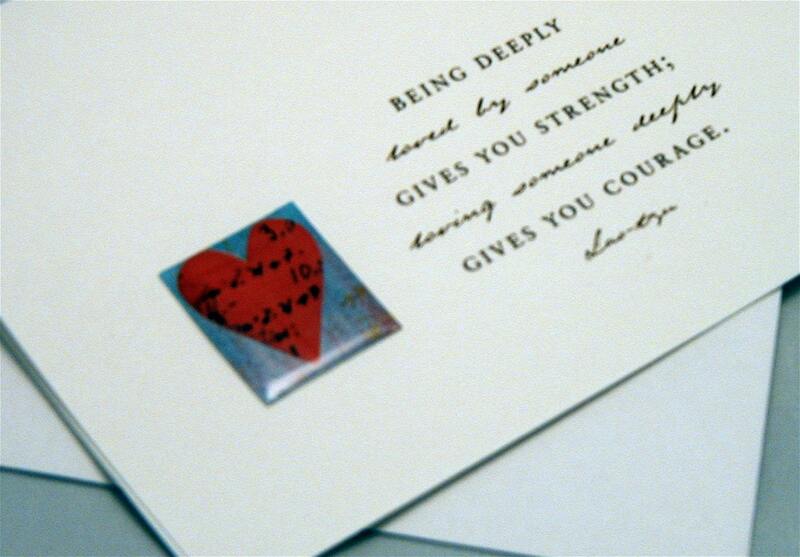 So get started planning that love hunt and get some of these wonderful envelopes! 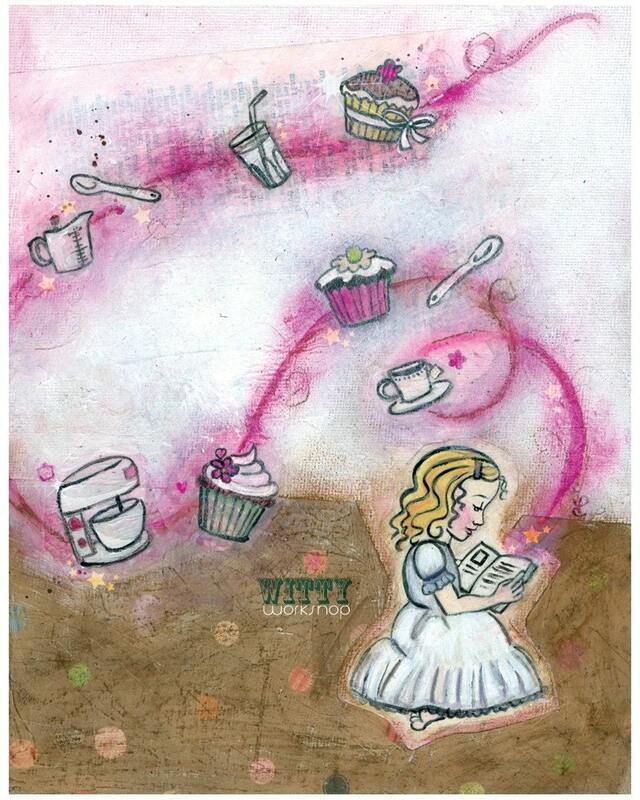 Carol has many other wonderful, fun paper designs in her store so be sure to check it out! Want to know more about what she's up? Then be sure to check out her blog. And while you're reading her blog be sure to check out all the CCCOE (California Crafters Club on Etsy) entries for our January Science challenge. Vote for your favorite and you might win a prize!